Australia's emissions are set to increase dramatically by 27% above 2005 levels by 2030 according to a damning report by the Climate Action Tracker consortium, taking into account Australia's low post 2020 targets announced on 11 August. Australia's climate targets are exceptionally low by international standards. The post 2020 target of 26 to 28 percent emissions reduction on 2005 levels by 2030 is substantially less than the major OECD economies of Europe and the USA. The USA may have a similar target but it is five years earlier in 2025. Even Canada, seen as being particularly weak at the federal level, has a 30 per cent target by 2030, higher than Australia. New Zealand's low target is also greater. Only Japan and South Korea have lower emissions targets than Australia. A week after the targets were released, the economic modelling was quietly uploaded to the Australian Department of Foreign Affairs and Trade website. The economic modelling by McKibbin Software was done for four post 2020 targets and all showed that GDP growth would continue to be above 2 per cent. "Targets of -26, -35 and -45 per cent relative to 2005 result in GDP being from 0.4 to 1.0 per cent lower in 2030 than with no target." says the report. A 13 percent reduction was also considered on 2005 levels which would hold Australia's total emissions at a constant level. 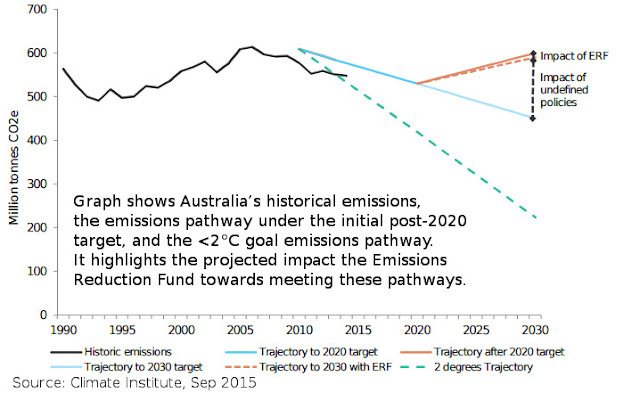 The targets were all modelled assuming the 2020 Australian emissions target of 5 percent below 2000 levels. 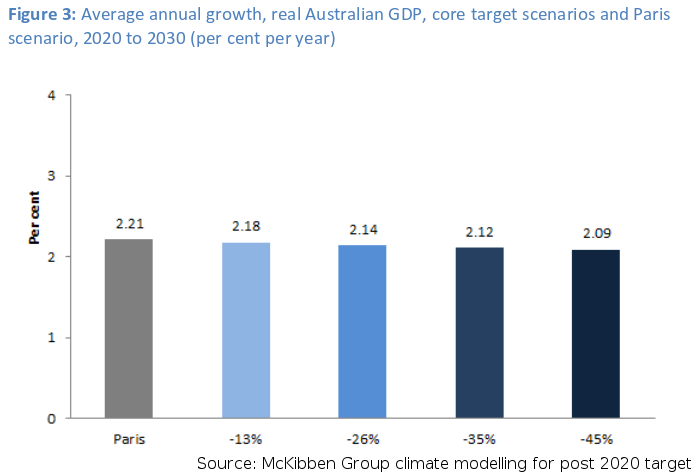 So, Australia could legitimately increase our climate target to 45 per cent on 2005 levels with only a slight reduction to GDP growth of about 1 per cent. In fact, on a graph of the impact of the different targets you can hardly discern the difference between 26 percent and 45 per cent reduction targets. Notice that our target baseline has also moved from 2000 to 2005, another way to fiddle emission targets and make it seem that we are doing far more than we actually are. The Carbon Tracker report says "A preliminary comparison between emissions data submitted in 2014 and in 2015 performed by the CAT reveals a high increase in emissions from LULUCF for the year of 2005", which explains a reason for moving the baseline. In other words, the Abbott Government is fiddling our carbon emissions accounting to make our target seem greater than it actually is. 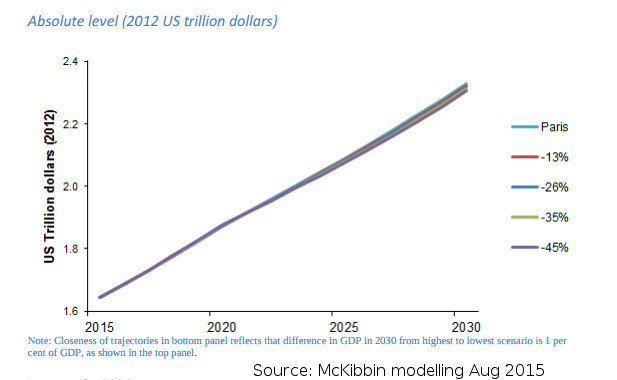 "The core target scenarios estimate that targets ranging from -26 to -45 per cent would result in GDP being 0.6 to 1.0 per cent lower in 2030 compared to without a target" says the report. The modelling focuses on achieving reductions primarily from Australia's coal dependant energy sector. "A post-2020 target will have a slightly higher impact on Australia’s economy than most other developed economies, but Australia is expected to grow faster than Japan, the EU and Canada. Consistent with other studies, the modelling finds that Australia faces larger economic impacts than most other developed economies to achieve similar emissions reductions relative to a historical base year." While the Borderforce fiasco was playing out in Melbourne, the Climate Action Tracker consortium released their latest report and rating of Australia's climate targets. It was damning in it's criticism. Australia's 26 to 28 per cent target by 2030 on a 2005 baslevel equates to a range of 5 percent below to 5 percent above 1990 levels. "All other industrial countries, except Canada and New Zealand, have proposed 2025 or 2030 goals significantly below 1990 levels." said Climate Action Tracker. "Australia stands out as having the largest relative gap between current policy projections for 2030 and the INDC target. With currently implemented policy measures, Australia’s emissions are set to increase substantially to more than 27% above 2005 levels by 2030, which is equivalent to an increase of around 61% above 1990 levels. Australia’s Direct Action Plan does not put Australia anywhere close to a track that meets its INDC 2030 target. The additional funding announced in August 2015 by the Government for post-2020, should it be re-elected in 2016, would reduce this projected increase by only 2%, to around 25% above 2005 levels (equivalent to 57% above 1990). "Of the nine industrialised countries assessed, Australia ranks eighth on its projected rate of reduction in per capita emissions, exceeded only by Russia, and eighth on projected improvement in emissions intensity for the period from 2012 to 2030, with Canada ranking worst." Could the criticism get any worse? Yes. "The CAT estimates that before the repeal of the Clean Energy Future Package, Australia was on track to meet their 2020 target. With the repeal, policies fall short and a cumulative abatement task of at least 153 MtCO 2 e between 2013–2020 remains. The scaling back of the Renewable Energy Target (RET) from 41,000 GWh to 33,000 GWh by 2020 translates into an extra 97-141 MtCO 2 e of cumulative abatement required during the period 2012-2030. After accounting for this and the effects of the ERF, we estimate a remaining cumulative abatement challenge between 2013 and 2030 of between 1.5–1.7 GtCO 2 e (equivalent to roughly three years of Australia’s current national emissions)." Instead of decreasing emissions by an annual average of 2 percent per year to meet our target, current policies are assessed to increase emissions at 1.5 per cent a year. "It is clear from our present assessment that currently planned policies are inconsistent with the INDC 2030 target and Australia needs substantially more policies to meet that target." 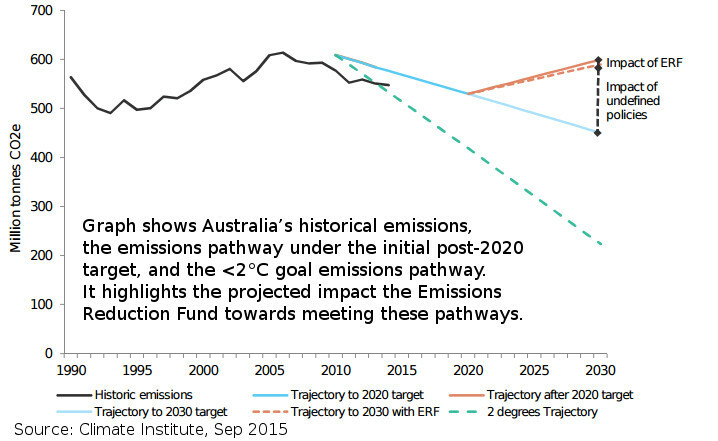 Carbon Tracker also has compared Australia's targets with other nations and the most common baselines of 1990, 2000, and 2005. The latest emissions gap report prepared by the United Nations Environment Program (UNEP) based upon a preliminary assessment of INDCs for 38 of the 59 submissions accounting for over 60 percent of global emissions. It shows that approximately 4-8 gigatonnes of GHG reductions by 2030 are likely to be reducied by these country commitments. However these commitments are not nearlyenough to keep temperatures beneath the 2 degree C guardrail agreed at Copenhagen in 2009 and confirmed at Cancun in 2010. "global emissions in 2030 will most likely be approximately 14 gigatonnes above the 2030 emission level that would be consistent with keeping the international community on track to meet the 2°C target." said the UNEP. The full The UNEP Emissions Gap Report will be launched early November and will provide an updated assessment of all INDCs submitted by October 1.But it is already clear that ambition needs to scale up for the Paris climate conference in December 2015. Australia's poor climate target has been noted by world leaders. Connie Hedegaard, writing in an opinion piece in The Guardian, "The level of ambition has not gone down very well with the international community. Only if all developed countries do their fair share of the required joint effort, can we expect developing and emerging countries to also take action." Climate Action Tracker Update 1 September 2015 - How close are INDCs to 2 and 1.5°C pathways?